"I need two copies of your passport page with your entry stamp. There is a copy shop in the last town you drove through about 20 kilometers back". 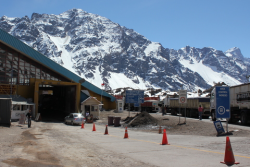 We do a write up about our border crossings explaining procedures and paperwork required. See our Border Crossings section.. Lists with coordinates for good camp sites are often shared among travellers. The Darien Gap is the border area between these two countries. There are no roads. We shared a container with a Swiss Land Rover. Unless you are able to share a container, shipping to South Africa is very expensive. We went for the Ro-Ro option. We write blogs in English and Norwegian. Our posts are the same in the two languages, but comments and questions will of course be different.